For decades now, Social Security has been sold to the American public as a retirement plan. Many Americans believe that their Social Security taxes go into an account that is held for them until they retire. In reality, Social Security is a pay-as-you-go program in which current tax receipts are used to pay the benefits for current retirees. Social Security was enacted into law in 1935. 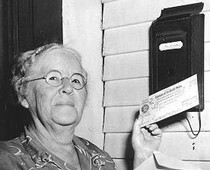 According to the Social Security Administration, the first Social Security beneficiary was Ida May Fuller of Ludlow, Vt. Fuller began collecting benefits in 1939 after paying into Social Security for less than three years. Her contributions (taxes) totaled $24.75. Fuller lived until 1975 and collected a total of $22,888.92 in Social Security benefits. This is equivalent to a return on her “investment” of over 900 percent. Current Social Security returns are approximately two percent. If Social Security were a true retirement plan, Fuller’s benefits would never have lasted for 36 years. Fuller’s benefits were being paid by the Social Security taxes of current workers rather than Fuller’s own contributions and interest. In other words, money in the Social Security Trust Fund is given to the general fund of the federal government in exchange for “special-issue” securities. The trust fund is filled only with s to repay the funds borrowed by the federal government. Thus far, the federal government has always repaid the funds with interest, but if the federal government is in default then it might not be able to do so. The AARP notes that fourteen percent of Georgians, primarily seniors, receive Social Security benefits. For more than thirty percent of these seniors, Social Security is the only source of income. If the Social Security Trust Fund were a true retirement plan in the form of a privately administered investment plan, it would be required to maintain a certain ratio of liquidity to invested assets. Instead, Social Security relies on current tax receipts and the repayment of funds borrowed from the trust fund by the federal government. Since current taxes cannot pay current benefits, if the government cannot repay its borrowed funds (with more borrowing), then it might well not be able to pay benefits to current retirees. It is likely that Congress and the president will come to an agreement that will continue to fund the federal government, but taxpayers should remember the summer of 2011 as the time when the myth of the financial security of Social Security was deflated.